ARLINGTON, Va. — Many people drive to work each day, but Arlington transit leaders want to know what it would take to make you ditch the car. Arlington has begun a Transit Development Plan to address key challenges ahead, as population and jobs countywide are expected to increase about 10 percent over the next 10 years. The growth will be most acute in Columbia Pike and Crystal City-Pentagon City. Columbia Pike is a key focus of the study, because it already has 17,000 people using Metrobus and Arlington Transit (ART) buses each weekday. Population in the Columbia Pike corridor is expected to rise 21 percent over the next 10 years. “With the elimination of the streetcar project, the Arlington Board wanted us to do a special effort to look at what kind of transit improvements should be implemented to address congestion,” says Mary Chevalier, Arlington’s interim transit chief. 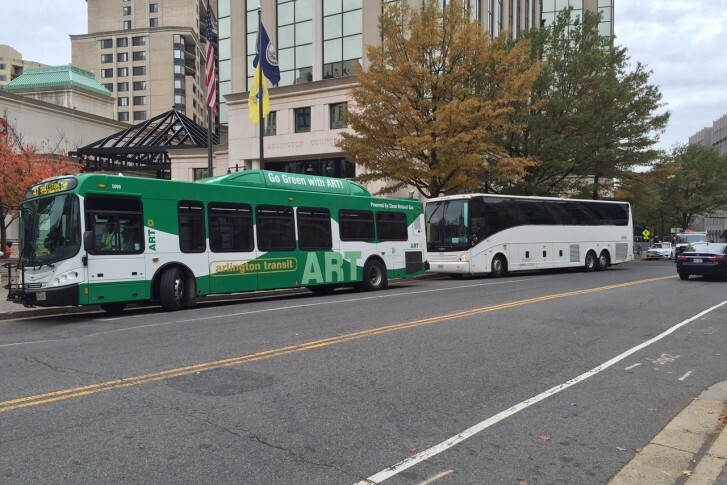 Buses serving Columbia Pike are already at or near capacity during rush hours. Buses tend to bunch along the corridor with buses stopping and waiting for everyone to pay the fare before departing. The transit plan will study several strategies to enhance bus service on Columbia Pike, including adding larger articulator buses, re-timing traffic lights to give buses more green lights and establishing off-board fare collection to get people onto buses more quickly. “People want to get to their destinations faster. When a bus is at the curb at a bus stop and people are taking time to put change in the fare box or reload their SmarTrip, it wastes time. If we can get that activity off the bus, hopefully it speeds the service along,” says Chevalier. Crystal City-Pentagon City is expected to see a 42 percent jump in employment in the next 10 years, because of its proximity to the Pentagon. It’ll also see a 34 percent jump in population. Fifteen Metrobus routes and four ART routes service the Pentagon City-Crystal City area. The area is home to a transitway which allows buses to travel in dedicated lanes between Potomac Yard and the Crystal City Metro station. “In the study we’re looking at an extension from the Crystal City Metro to the Pentagon City Metro. We’re looking at that connection. Where should it go? How should the route operate? The lanes and the station — that is an important part of the study,” says Chevalier. Surveys from the county show that most residents want more frequent service and more evening and weekend service in both corridors. Residents also want more connections to get people from Columbia Pike to Crystal City-Pentagon City and back. You can also submit comments online for the next month. The final plan will be presented to lawmakers next spring.